Lazio have been ordered to play their next two home European games behind closed doors following crowd trouble. Uefa has taken the disciplinary action following some of the Italian club's fans' continued racist behaviour. Earlier this season, the Rome-based club were fined £120,000 by Uefa following racist chanting in a Europa League game against Tottenham Hotspur. Lazio supporters have been found guilty of racist behaviour by Uefa four times during the current campaign. The latest incident came during their Europa League last-32 match against Borussia Monchengladbach on 21 February. The Serie A club won the second leg 2-0 to progress 5-3 on aggregate. 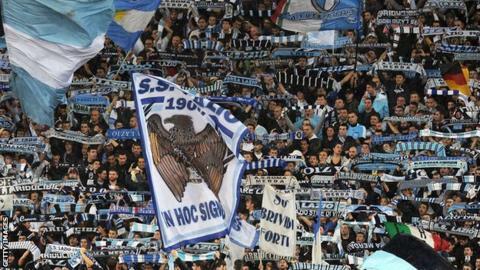 Uefa said the two-match supporters' ban will start with Lazio's Europa League game against VfB Stuttgart on 14 March. "The remaining game behind closed doors applies to the next Uefa competition match for which the club would qualify. The Italian club have also been fined 40,000 euros (£34,475)," Uefa added. Lazio president Claudio Lotito said the sanction was "incredible" and that his club would appeal against the decision. "To suffer a punishment of one or two games behind closed doors, which will cause serious economic damage to the club and prevent fans from participating in an event like this, seems absurd to me," he added. Meanwhile Uefa has also warned Turkish side Fenerbahce that they face suspension from European competition if problems with supporters continue. The club's last European game, against BATE Borisov, was played behind closed doors but was still disrupted when fans threw fireworks from outside the stadium.